A fabulous 'It' bag hommage! I know, I know. I promised a flare's post next but I just couldn't resist sharing this! Those people at H&M are very clever aren't they.....what should plop on the doormat yesterday.....only their latest brochure and I spied this gorgeous style steal straightaway! I couldn't link to the Mansur Gavriel bag as it is pretty much unobtainable (apparently their website says they are restocking in March....form an orderly queue please!) but in the mean time given that the H&M one is a much more palatable £19.99 and will be a lot easier to get hold of......on your marks.....get set.....go! You can order it here! Oh, and yes of course it is my first purchase of February! I managed to find it in store today! Although it's not leather, the detailing is pretty good, they have even added a little attached pochette inside for your keys etc. Not bad for £19.99! After the success of the H&M fringed bag it would have been rude not to! I thought I would try something different to the usual selfie in front of the mirror today. I fancied a change of scenery and as there was some glorious sunshine earlier I took advantage of an outdoor shot! Now this isn't easy and I could probably do with investing in a selfie stick but I gave it a go! As always love reading and responding to your comments. I think a selfie stick HAS to be the way forward as my phone hates the light in my bedroom. That bag is AMAZING what a find! My flares are under construction at the moment.....i.e being altered, once they are back in my possession I should be good to go! The lack of good light inside the house was my reason for venturing outside...no one home to help me out by taking a piccie! What an amazing steal Michelle, it would most definitely have been rude not to & I just love the idea of the inside purse for keys etc......off to investigate further!!! 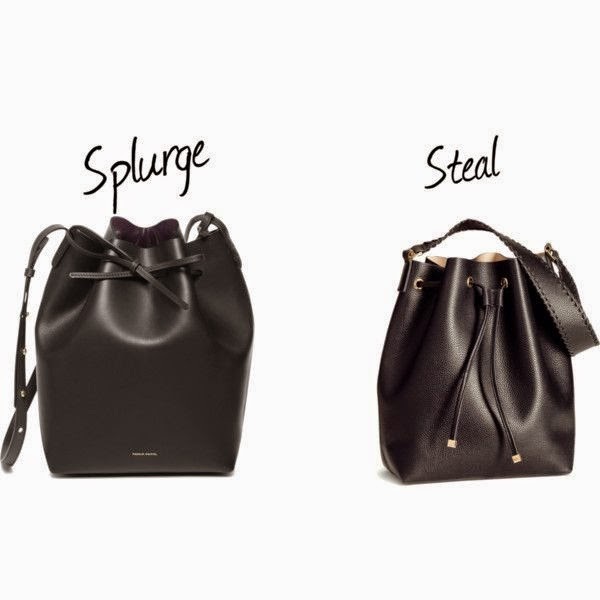 I have been lusting after the Mansur Gavriel bag so I'll defo be checking out H&M offering. Thanks for the heads up. I quite like the interesting angle Helen.....enough to give another go and keep persevering with it! I am so sick of seeing myself in front of the mirror! Oh yes Helen, I have only dipped my toe in this murky selfie stick stuff! I a very kind friend has offered to lend me one of her kids (yep....I laughed at that too?!) to practice and see if it was something worth investing in! I had a selfie stick. I used it once and broke it. And I felt a bit of a nonny using it. But yep - H&M are doing well with their bags - did you spot the YSL lookalike in store too? I admit I did feel a bit of a wally taking the pic....am definitely find a more private spot to take any future 'from where I stand' shots so's not to embarrass myself! You always have your finger right on the pulse and spotting this little beauty is no exception. Well, the photo looks great! I can imagine the outfit straight on even though your photo is from an angle so great job! Thank you! The more I look a the photo the more I like it so I am going to try it again today. I love the way they call it vegan leather....lol! What a cop out, though I shall now be referring to the new H&M bag as vegan leather ;0) it does sound so much better than PVC. I think that H&M have really excelled themselves with their accessories as they had some great jewellery and I am a massive fan of their snoods and knitted beanie hats too! Weirdly, I have never really got into the designer bag thing. I can't think why, I spend enough time obsessing over clothes and shoes! I could quite easily get on board with another £19.99 bargain though! Well spotted Michelle!! A Spring/Summer wishlist of sorts! A couple of days away! Hanging my head in purchase shame.